You can find many formal reviews of the Garmin Montana online, and some excellent instructive videos on YouTube. As usual with my electronic gear and fancy software, I use less than 10% of their actual capacities. I need a GPS to record sample locations, remember where I parked the vehicle, and figure out how to get from here to there before sunset. The Garmin Montana has made all of this so much easier and intuitive than with my many past GPS devices. The Garmin Montana is touchscreen-operated, which makes a huge difference when you need quick measurements and want to record waypoints. The screen is also plenty large and in color. I can now record a waypoint and then edit its name (015 becomes “camels be here”, for example). I can also add a long note to each waypoint, all done with a qwerty typepad in landscape mode. So easy. The map and go-to functions are also easily accessed and used. There is a real magnetic compass inside to supplement the one based on the GPS system. There are many other extras, from waypoint averaging (increasing the accuracy of a waypoint) to sunrise/sunset local times, a calculator, alarm clock, stopwatch, calendar … you get the idea. You can even use the device to pace out a polygon and measure its area. Melissa is currently using my old Garmin because of all its stored waypoints from Israel, so we’ve been able to see the two devices in action together. 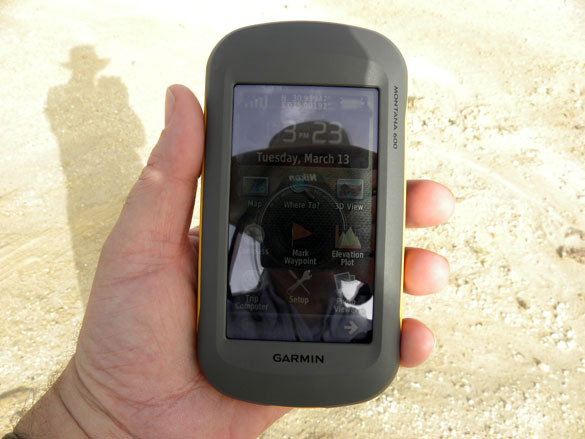 The Garmin Montana receives data from the satellites much faster, and I suspect it is more accurate. 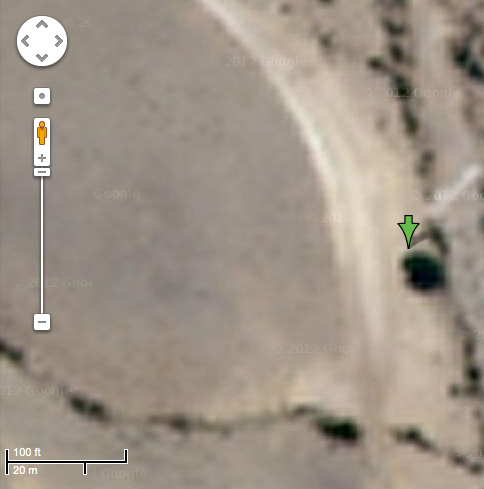 My test is to stand at an easily recognized point and take a measurement, then look at it on Google Maps. Above you see a Google Map view of an acacia tree along a wadi in Makhtesh Gadol. I stood beside it and took the measurement shown by the green arrow. At most there is a meter or so difference between where I was standing and what is indicated, so Google Maps has a little correcting to do!